Luxurious and contemporary, with superb private pool villas and an idyllic overwater spa, the island paradise of Coco Bodu Hithi is located in North Male Atoll and is a 40-minute speedboat ride away from Malé International Airport. Even in low season, Coco Bodu Hithi has a very high occupancy rate. Opened in 2005, with its fabulous atmosphere this modern, romantic 5-star resort undoubtedly makes an impression on couples and so popular because it is reasonably priced and is elegantly modern yet distinctly Maldivian. There are 100 villas (44 on the sand, 66 over the water), and each comes with its own small pool and outdoor shower, not to mention the design of the indoor bath, and the Nespresso coffee maker. There are six chic restaurants, two open air cocktail bars, extensive thatched overwater spa and a fitness center (with ocean views!). An uncrowded infinity swimming pool and a large selection of activities, including scuba diving and snorkeling in the lagoon. Despite all these facilities, guests - especially at night - tend to seek privacy in a private getaway, possibly with a bottle from Wine Loft. The resort is 45 minutes by speedboat from Malé airport; those who prefer to be closer must check Taj Exotica, just 15 minutes by boat. Brand marketing is brilliant and, in our case, not misleading. From concept to delivery the place is really well thought through. With its white sands and crystal-clear waters, Coco Bodu Hithi is stunning, but, heh, nothing’s perfect. Let’s see if it’s right for you. A sister propety, Coco Palm Dhuni Kolhu won the presidential Green Award a few years ago, and care of the environment here is also evident. The island's interior is replete with the Maldivian flora and not only with coconut palms - it is a variety of trees, shrubs and flowers that really amazes when walking along sandy paths. Vegetation is also used as a natural shield between villas for more privacy. Like many other resorts, Bodu Hithi lives in time, ahead of Male for an hour ahead to offer guest more daylight. 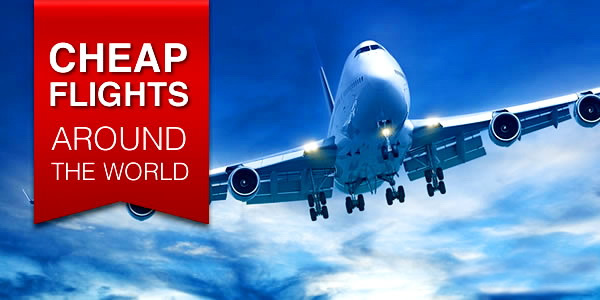 Despite the fact that it is a good idea in the long term, after receiving an hour upon arrival, guests can lose it when check out from the hotel. The island is quite large compared to other resorts, but it is easy enough to move with beautiful sandy paths surrounded by lush tropical vegetation. In other cases - electric cars are always at hand - just call. Along the paths you can find small commemorative plaques, and palms planted by previous guests during the honeymoon, wedding or anniversary. Guests are a mix of Europeans (who usually book beach villas and apartments) and Asians (who like to stay in water villas); The latter, in general, prefer privacy. After dinner, do not expect nightlife and most guests prefer to admire the tropical starry sky under the full moon, and the resort's romantic lighting creates a magical surrounds; the walkways are nicely illuminated and only the rustling of palm trees and the hiss of waves are heard. As a rule, guests go to their fabulous rooms to enjoy peace and quiet. Nevertheless, the manager's plans are to add live Cuban music in the evenings. Notification for guests is issued the day before check out with instructions for departure. Before landing on speedboat, a some staffs gather and warmly say goodbye, offering bottled water. The moods are very touching and sincere - in general, a great way to finish the trip ... by paying a giant bill. Coco Bodu Hithi is one of the three sisters of the Coco hotel collection in the Maldives - it is more luxurious (and expensive) than the Coco Palm Dhuni Kolhu, but not as expensive as the ultra-prestigious Coco Privé Kuda Hithi Island, which can only be rented in its entirety. Most of the guests here are couples; families are best placed to pay attention to Centara Grand Island Resort & Spa, where there is a children's club. 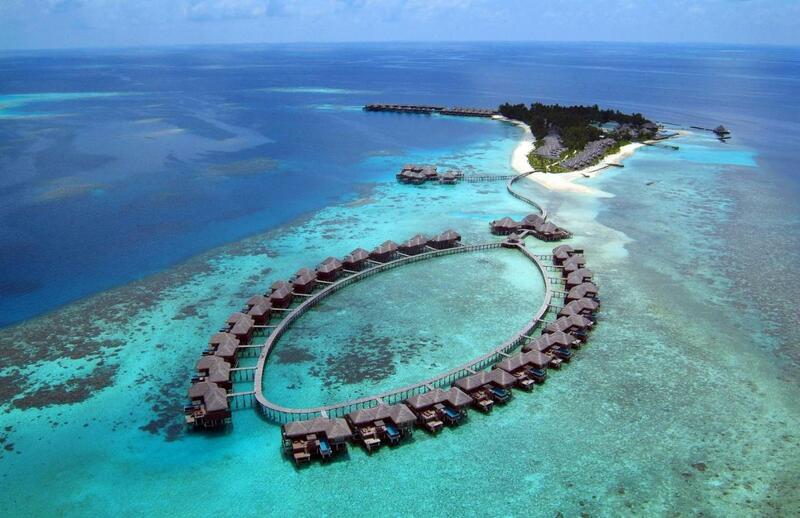 Coco Bodu Hithi is located on a tiny speck of a private island in the North Male, Kaafu atoll. After baggage claim at Male Airport guests will be escorted to the boat where they will be offered drinking water. Depending on the wind and weather, the trip takes about 40 minutes. Ringed by pristine palm-fringed beaches, the picturesque island is impressive at first sight, and the ong arrival jetty, flanked by wind-blown palm trees leads to the sand, the reception area, and the main pool welcomes you with wow factor. Guests are welcomed by a staff team and then escorted to the restaurant hall for personal registration with a welcome drink. 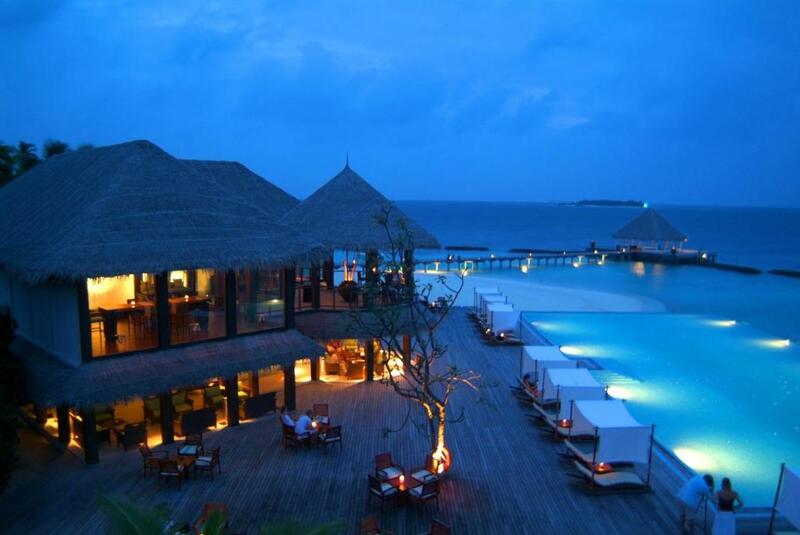 Maldives is an independent state in Indian Ocean, consisting of 26 atolls and more than 1190 islands. Each resort (there are more than 130 of them) is located on a separate private island, providing peace and quiet. The island’s surrounding crystal-clear waters is a playground for native nurse sharks that lazily zigzag among an abundance of colourful marine life. Coco Bodu Hithi is a relatively large island, compared to some neighbors, and even looks even more because of the long jetties with water villas leaving the lagoon. Despite this, many guests like to walk (especially nice at sunset and sunrise), otherwise there are electric cars 24 hours. 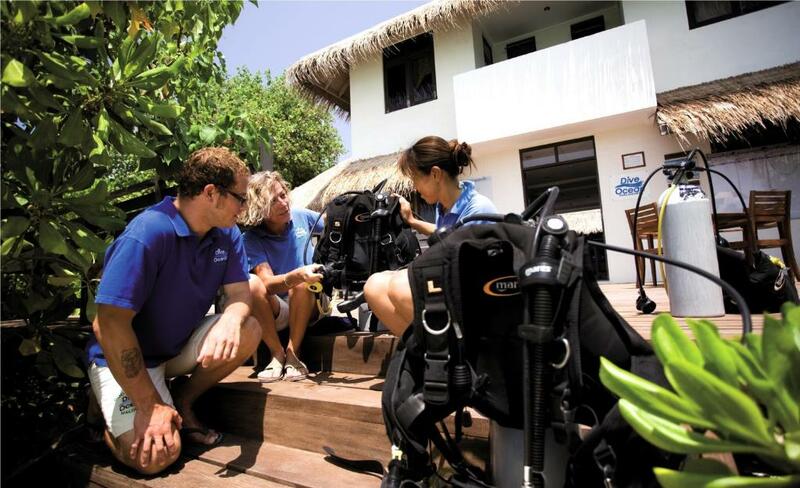 The resort offers excellent snorkeling at specific lagoon's spots and a fun diving with 5-star dive center PADI. In this hotel really luxurious rooms and in our opinion, a good value for money. A brilliant Maldivian architect and a team of French designers created a winning combination of pretty thatched roofs and wood constructions surrounding the beautiful, modern interior of the island. The surroundings establish an appropriate barefoot island vibe, while the interiors are anonymously luxurious and remarkably timeless. Just don’t expect overly modern trimmings, such as bedside USB ports. There are 100 villas in four categories; most of them over the water on either side of two separate jetties. The design is featured by modern marriage (nebulous furniture, colorful striped bedspreads on luxurious white blankets) with traditional Maldives' attributes (thatched roofs, lots of beautiful dark wood). All rooms have private pools (really stunning), designer solutions in the bathrooms, indoor and outdoor showers, double sinks, generous servings of green tea and toiletries, bathrobes and slippers. The mini-bar is packed with wine, liqueurs, beer, soft drinks, drinking water and snacks, and + a disposable Kodak camera (Water Villas come with Ramen noodles, for Asian customers among which this category is the most popular). There is a free Nespresso coffee machine, a set of teas with traditional teapots and drinking water, but for most guests the amount of water is surely not enough and in the end - everyone buys. Upon arrival, guests at the villa will find a plate of exotic fruits and a bottle of sparkling wine (or Moët with higher room category), along with greetings from the general manager and Maldivian "Welcome" laid out on the bed with palm leaves. Villas are also equipped with a DVD player and sound system with a set of CDs of traditional music. Water villas sit on stilts over lagoon. And although they have beautiful views and a direct gateway to the world of snorkeling - to the white sands of the beach they are far away. All villas are large - if not more Island Villas and equipped with comfy double beds overlooking the deck with a private pool with a wonderful view, table, chairs and sun loungers. The large bathrooms have a backyard with an outdoor shower and designer baths that differ in design from Island Villas. 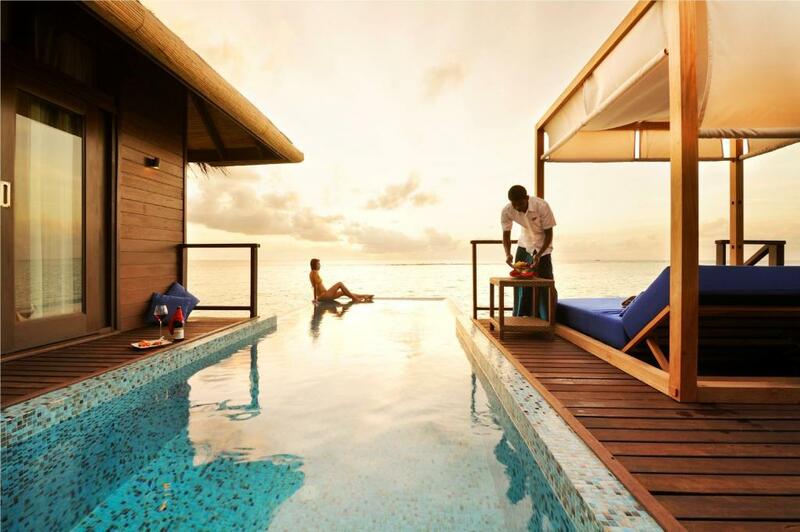 Escape Water Villas is a step up the size with a separate living room and a built-in bar. Windows from floor to ceiling allow you to watch 24/7 TV series about the sea right from the bedroom and not just from the deck. 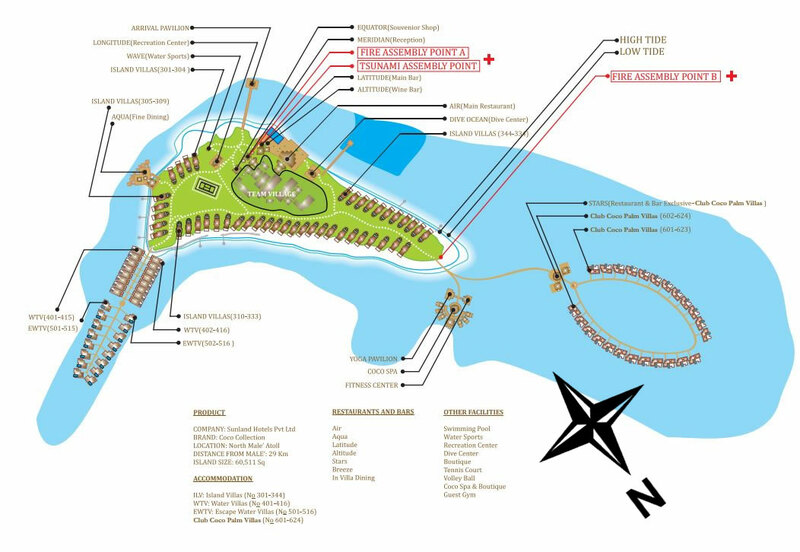 There is a relatively good snorkeling from Water Villas in the southern part of the lagoon, past Aqua restaurant and on the north side near the island's tip around Escape Water Residences. These residences are moored at a separate jetty (northern) for greater privacy and feature large water villas, with even larger living space and a dining area. They are far from the center of the resort, but closer to the spa, fitness center, and The Stars restaurant. Europeans love to stay at Island Villas that are located along the beach line. The Island Villas have a large round bath in the center of the room. From the bath you can watch TV or monitor what is happening on the veranda or on the beach. On the other side is a swimming pool in the garden and with a couple of sun loungers. As expected there is a TV with a wide screen and satellite channels, with a DVD player and a USB port. Surely you will be disappointed by the pressure of water in the shower, but this problem is widespread in the Maldives. In the same way, most guests have a nice beach, but not in all places on the island. Some have a low wall and steps down onto a sandy lagoon. People do not tend to wander around the island, so there is a feeling that ti's your personal space. The appetites and tastes of guests are run the Moroccan chef and there are six restaurants with open hours that vary depending on the day of the week. Those guests who stay in Water Villas and Island Villas will have easier access to the reception and swimmong pool that form the resort's heart. The Air is the main restaurant with an à la carte menu and a buffet dining. The quality fusion food is served for breakfast, lunch and dinner with tables in the shade or on the terrace overlooking the water. (for a buffet restaurant the evening atmosphere is quite romantic). Above the Latitude bar is Tsuki, Japanese dishes for lunch and dinner and next to you will find the amazing Wine Loft, which opens for romantic dinners and special events. Here, behind the glass walls is a collection of bottles with a variety of 250 labels from 11 countries, from $ 50 to $ 2,500. In Wine Loft you can also stock up on drinks for your villa. Across the island there are Aqua and Stars; these two are more expensive and fine dining options and both restaurants offer a great ocean views (table reservation is required). Guests staying in Escape Water Residences can use the Stars restaurant for breakfast. There are two meal plans in the resort: "very good breakfast" and half board "breakfast + dinner". In addition to restaurants, there is a 24 hour room service and private dinners can be arranged in villa or on the beach. Weekly there are beach parties with barbecue seafood. For a night cap there are two main bars to choose from: the Latitude Bar & Lounge next to the pool offers a list of drinks and a snack menu throughout the day, and a cocktail bar in The Stars. This spot is the only place where people get together to enjoy the company or at least the buzz of other guests who are also good at spending time. 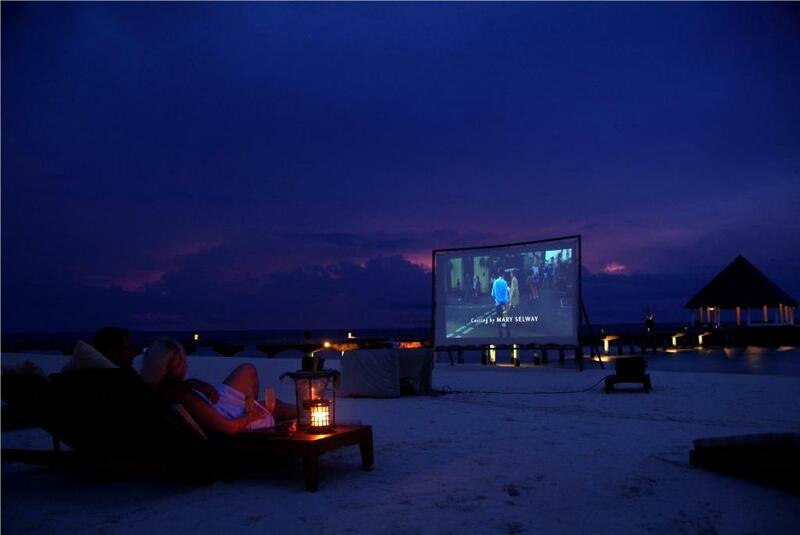 At night, the resort is pretty quiet apart from movies and computer games in Latitude on the big screen, although recent years see evening entertainment for guests. This is not the kind of place that continues to hang out after midnight and yet there is a local group of animators, if you have not made new friends. 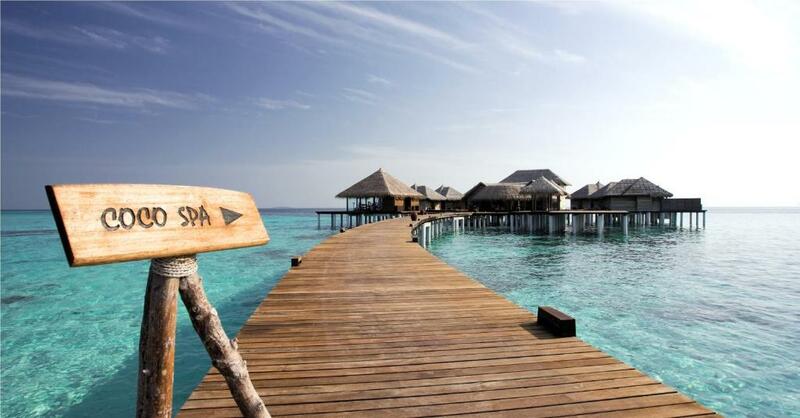 Coco Bodu Hithi is basically a discreet couples or honeymooners resort. Diving is excellent everywhere. The main underwater landmark is Manta Point where the concentration of the manta rays is especially great between December and April. These giants can even be available for snorkeling since they play 2 meters and deeper. Most of the dive sites are in 20-30 minutes by boat. Easy access thilas nearby (starting near the surface and protected from currents) promise juvenile black tip sharks, turtles and enormous table corals. The Protected Marine Area of Rasfaari is just a few minutes away, brimming with new corals and schools of fish. Crowded with coral and fish schools, the Rasfari Island Marine Reserve is just a few minutes south. If you chose diving, you will enjoy individual service, because a relatively small number of guests come to Coco Bodu Hithi just for diving. Serious divers are usually not interested in luxury accommodation and services, and they prefer to invest in scuba diving. Offering ultimate relaxation in six treatment rooms, Coco Spa has a superb overwater location in the northern part of the resort next to the cozy Escape Water Residences. Ultra-modern rooms can feel a little less romantic than others in the Maldives, but quality and effective facial and body treatments, as well as various massages, including Thai are popular with hotel guests, and complemented by beautiful sea views. Spa cosmetics are used - Aqua di Parma, a high-quality product from Louis Vuitton, and next to the spa you will find a gym and a pavilion for yoga practicing. Some of the island's beaches are prone to erosion but there are two healthy stretches of sand with sun beds and hammocks. The infinity pool with chic lounges around it (a bit in the shade), and never seems crowded, thanks to the fact that the villas have their own pools. Water sports include free of charge snorkeling gear, also offers kayaks, windsurfing, catamarans, and jet skis. On land guests can play tennis, volleyball, where the recreation center is designed for table tennis and billiards. The resort has a boutique with clothes and essentials (prices are high!). In our opinion: this 5-star resort is popular thanks to reasonable prices and elegant modernity which is still distinctly Maldives. With its exellent island location, stunning scenery and luxurious accomodation, Coco Bodu Hithi is a nice place for a romantic getaway and relaxation for those who can afford to spend at least a thousand dollars a day. A beautiful island with magnificent views in all directions, an excellent entrance to the sea from the beach, many colorful fish. Large main swimming pool. 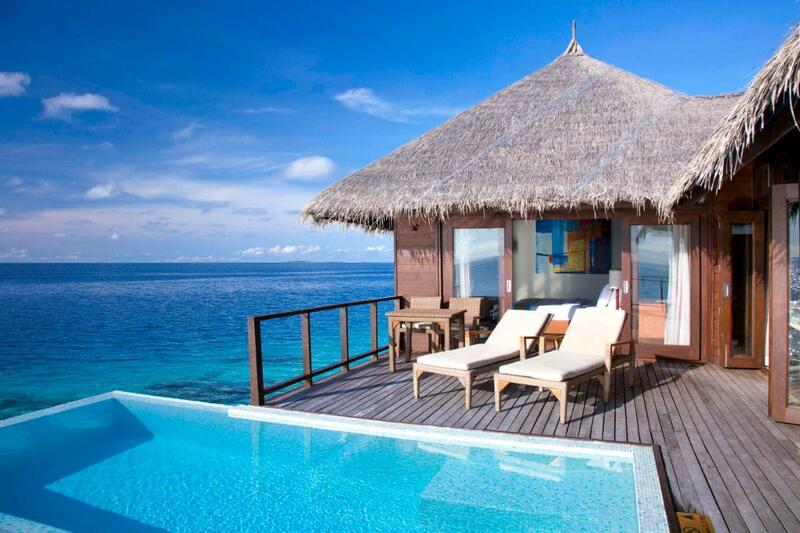 Water villas with pools is just awesome. Amazing views from the bedroom. Good accessories in the bathroom. The food is insane, varied and everything is delicious. No kids' club but babysitting services can be arranged and there is a children's menu at Latitude.